Poll: Conflict between Quebec and the rest of Canada considered more serious than other regional conflicts in Canada. A majority of Canadians disagree with Justin Trudeau’s comments about Albertans controlling the agenda. A new national survey by public opinion firm Abacus Data on regional conflict and views towards Alberta finds that most Canadians perceive the Quebec question in Canada as the most serious regional conflict in the country. Eighty percent of Canadians rated the conflict between Quebec and the rest of Canada as very and somewhat serious compared with 42% for Western Canada vs. Eastern Canada, 45% for Alberta vs. the rest of Canada, and 26% for British Columbia vs. Alberta. 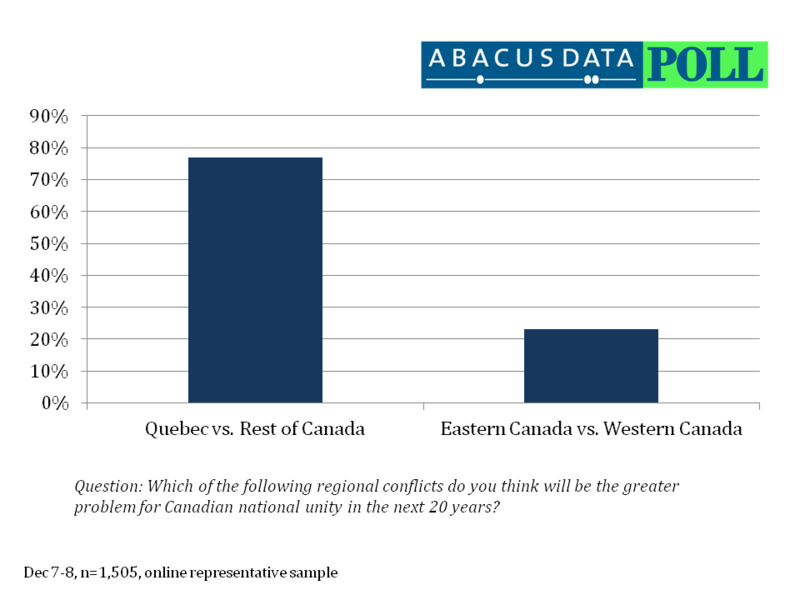 “A large majority of Canadians across the country, including in Quebec, believe that the Quebec question will be the greater problem for Canadian national unity over the next 20 years than conflict between eastern and western Canada,” said Abacus Data CEO David Coletto. “While many consider conflict between Alberta and the rest of Canada as serious, the level of concern is still nowhere near that of issues around Quebec. Respondents were also shown the statement that Justin Trudeau made two years ago in an interview on Quebec television in which he said, “Canada isn’t looking good because it’s Albertans who are controlling our community and social-democratic agenda. It’s not working”. They were then asked whether they agreed or disagreed with this comment. Overall, 29% of Canadians either strongly (7%) or somewhat (22%) agreed with the comment while 50% disagreed (22% somewhat/28% strongly). Twenty percent of respondents said they were unsure of their opinion. Agreement with Mr. Trudeau’s comment was highest in Quebec (47%) and Atlantic Canada (37%) and lowest in Alberta (15%), British Columbia (20%), and in Manitoba and Saskatchewan (20%). Among different federal party supporters (vote choice at the 2011 federal election), 79% of Conservative Party supporters disagreed with Trudeau’s comment while less than a majority of Liberal and NDP supporters disagreed (38% of Liberal voters and 35% of NDP voters disagreed). Nationally, most Canadians surveyed (54%) said they had a favourable impression of Alberta while only 16% said they had an unfavourable impression. Thirty percent were neutral towards Alberta. For comparison, in past surveys, Abacus Data found that Newfoundland and Labrador had a more positive rating (62% favourable/4% unfavourable) while Quebec was viewed less favourably (27% favourable/50% unfavourable) than Alberta. The only regional variation was found in Alberta where respondents were more likely to have a favourable impression (no surprise!) and in British Columbia where respondents were most likely to have an unfavourable impression (favourable 50%/unfavourable 28%) of their neighbouring province. A majority of Canadians (63%) agreed that Canadians from all provinces benefit from Alberta’s oil and gas industry while 27% disagreed. Quebecers (50%) were least likely to agree while Albertans were the most likely to agree (93%). However, when asked whether Canadians from other provinces are jealous of Alberta’s natural resources, a slight majority (50%) agreed with the statement (13% strongly agree/37% somewhat agree) while 38% disagreed. Albertans (74% agree) were the most likely to agree while Quebecers were the least likely to agree (45% agree). Also of note, 68% of Conservative Party voters agreed while 41% of NDP and 44% of Liberal Party supporters agreed that Canadians from other provinces are jealous of Alberta’s natural resources. Respondents were also asked whether they thought one province in Canada gets more than its fair share from the federal government and whether the Conservative government favours one province over others when it comes to its policies. Overall, 63% of Canadians believed that one province in Canada gets more than its fair share from the federal government. Of those, 57% believed Quebec gets more than its fair share followed by Ontario 22%, and Alberta 14%. Interestingly, one in three Quebec respondents believed that Quebec gets more than its fair share from the federal government while large majorities who believed one region gets more than its fair share in Ontario (64%), Alberta (82%), and a slight majority in British Columbia (51%) picked Quebec as well. When it comes to favouritism by the Conservative government in Ottawa, 58% of Canadians surveyed believed that the current federal government benefits one region over others when it comes to its policies. Liberal Party and NDP supporters were most likely to believe this (NDP 72%, LPC 65%) however 47% of Conservative supporters also agreed. Among these respondents, no one single province stood out as favoured. About four in ten (38%) selected Alberta, followed by Quebec (31%), and Ontario (26%). Atlantic Canadians, Quebecers, and Ontarians were most likely to select Alberta as favoured by the Conservative government while Albertans and those living in Manitoba and Saskatchewan were most likely to select Quebec. British Columbians were more divided with 37% selecting Quebec and 36% selecting Ontario. Respondents were also asked to rate the seriousness of a number of regional conflicts that may exist in Canada. Overall, 80% of Canadians surveyed considered conflict between Quebec and the rest of Canada either very or somewhat serious. Forty-five percent considered conflict between Alberta and the rest of Canada as serious while 42% felt the same way about conflict between eastern and western Canada. Comparatively speaking, fewer Canadians felt that conflict between Alberta and B.C. was serious (26%), however British Columbians were far more likely to consider it serious than other Canadians (40%). When asked which conflict, Quebec vs. the rest of Canada or Eastern Canada vs. Western Canada, was likely to be the greater problem for Canadian national unity in the next 20 years, 77% of respondents picked Quebec vs. the rest of Canada, while 21% selected Eastern Canada vs. Western Canada. Responses were fairly consistent across the country. Finally, respondents were asked to select the national political party they felt was the best and the worst when it comes to national unity. Overall, there was no “winner” when it came to the best party for national unity. Twenty-four percent of respondents selected the NDP, while 23% choose the Conservative and Liberal parties respectively. Three percent selected the Green Party while 27% of respondents were unsure. Not surprisingly, there was a strong correlation between past voting behaviour and selection of “best” for national unity. Over sixty percent of Conservative, NDP, and Liberal Party supporters from 2011 selected the party they voted for as the best. Interestingly, 20% of NDP supporters believed the Liberal Party was best for national unity. When it came to selecting which party was worst for national unity, 34% of respondents selected the Conservative Party, followed by the Liberal Party (18%), NDP (11%), and the Green Party (9%). Twenty-seven percent of respondents were unsure. Most Canadians have a favourable impression of Alberta and the oil and gas industry, the Rocky Mountains, and Alberta beef are key components of its image for Canadians across the country. 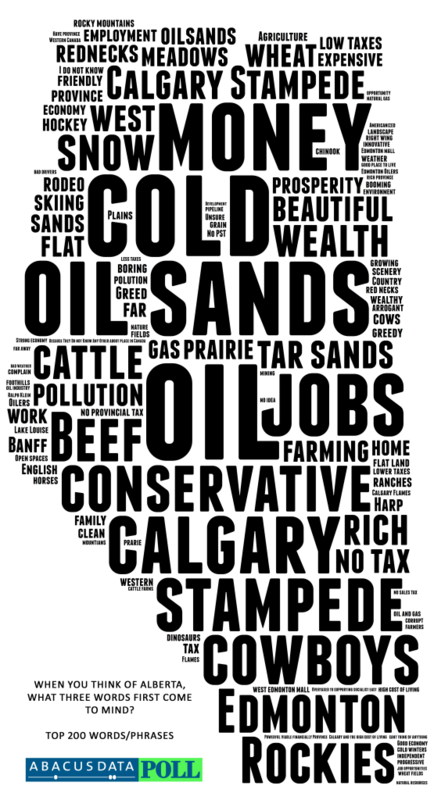 And while most Canadians agree that all Canadians benefit from Alberta’s oil and gas industry, many also agree that Canadians outside of Alberta are jealous of the province’s natural resources. This regional jealousy is fueling conflict between Alberta’s wealthiest province and its neighbours but for most Canadians, national unity battles still centre on the role of Quebec in Canada. The survey was conducted online with 1,505 respondents in English and French using an internet survey programmed and collected by Abacus Data. A random sample of panelists was invited to participate in the survey from a panel of over 150,000 Canadians. The survey was completed from December 7 to 8, 2012. The margin of error for a probability-based random sample of 1,505 respondents using a probability sample is +/- 2.5%, 19 times out of 20.